If I purchase or Lease a unit, do I have to purchase a service contract or can I just pay for service calls and order supplies as needed? No, you do not have to purchase a Service Contract Agreement and yes we will service the unit for you and bill on a per call basis for the call and any parts or supplies needed. However, the service contract can be a great benefit to you and actually save money in many cases if you were to need service more than a couple of times and parts repaired. All service contracts at least include the labor and parts (not all contracts will include supplies) but with the parts alone, it is worth having a service contract agreement. Many businesses opt for leasing because this has less of an impact on cash flow than purchasing machine(s) outright. Leasing offers a monthly payment that allows you to manage your cash flow for budget purposes with the use of the equipment immediately for a fraction of the cost of a purchase. Flexible terms are available from 12 to 60 months. Leasing offers many cash management, equipment obsolescence, and tax advantages not found in cash purchases. For your particular company situation, you should always consult with your legal, tax, and/or accounting advisor for leasing/purchasing recommendations. What is the benefit in having a service contract on my unit? A service contract is actually a Guaranteed Agreement that Systel will service and supply your unit, with whatever items are covered in your particular agreement during the coverage period of your contract. All contracts will include travel, labor and parts. We do have various contract coverage types; however, each coverage type depends on the type of unit purchased. Some contracts will cover parts and supplies and some may cover partial supplies. A Systel Sales Representative or Systel Service Contract Representative can give you more detailed information of what coverage types are available for your particular unit. If Systel cannot repair my unit, what will happen to my contract? Your contract will remain in place for the remainder of the current annual term and Systel will provide a service loaner unit of equivalent likeness for the remainder of the contract term. Can I cancel my Service Contract at any time without penalty? Is any unused portion of my service contract agreement refundable? Systel requires a written authorization to cancel the service contract agreement sent to Systel Service Contract Department at least 30 days prior to the annual renewal date of the service contract agreement. A final meter reading is required to determine if any overage is due. Any supplies rendered within 90 days of the service contract cancelation are billable as they are consumable items. The service contract agreements are not refundable nor are they transferable. If I were to upgrade my unit prior to the annual anniversary date of my contract, will I receive a refund for the unused portion of the contract year? If you upgrade your unit and purchase or lease a new unit with Systel, we will apply any unused service credit toward the service contract on the new unit. The credit is determined by reviewing the amount of time remaining, as well as the amount of unused copies remaining on service contracts agreements that are paid upfront quarterly or annually. Monthly contract billings are not paid in advance of the current period of use and no credit is available on monthly billings. When should I replace my toner? Do I need to replace my toner as soon as the “toner low” message comes on? In order to get the most value out of your toner, you do not need to replace the toner as soon as the message appears. When you see this message, confirm you have a replacement available and if you do not, place your order with Systel at that time so that you have it available when you need it. Is there anything I can do if my machine has stopped working because I have run out of toner? Make sure your order has been placed with Systel. You can attempt to shake the toner bottle/cartridge (carefully because toner may spill out) and place it in the machine. This action MAY allow you to make a few more copies. Can I remove and/or clear an error code without placing a service call and/or have a technician work on my machine? Some error codes can be reset by turning the machine off at the main power switch, waiting 10 seconds and turning the machine back on. If the code does not clear or continues to reoccur, then Systel needs to be contacted to service your machine. Do you offer electronic invoicing and online payment of invoices? Yes, please contact us to get your account set up for electronic invoicing and/or online payments. Why is the Leasing Company billing insurance? Per the Lease agreement, the customer is responsible for all risks of loss or damage to the equipment for any amount equal to its replacement cost. Customer will list the leasing company as the sole loss payee of the insurance for the leased equipment only. Please reference the model and serial number of the leased equipment. The customer may do this by contacting their Insurance Department or the Insurance Agent that handles the insurance for their company. This can be faxed to: 910-483-2846. If this is not provided within 60 days of the first lease payment you receive, the leasing company will bill the insurance charge and this will appear on the monthly lease invoice unless a Certificate of Insurance is received from the customer showing the Leasing Company as the Loss Payee for the leased equipment only. Once received by the leasing company, the lease account is set up not to bill the insurance. Do I have to report meters on the unit if I purchase a Service Contract? Yes, meters are required for billing purposes if the Service Contract that you purchase has a committed volume of copies or is based on a cost per copy billing cycle. What is Systel Business Equipment Co. Inc. Federal ID #? The Federal ID# 56-1313968. 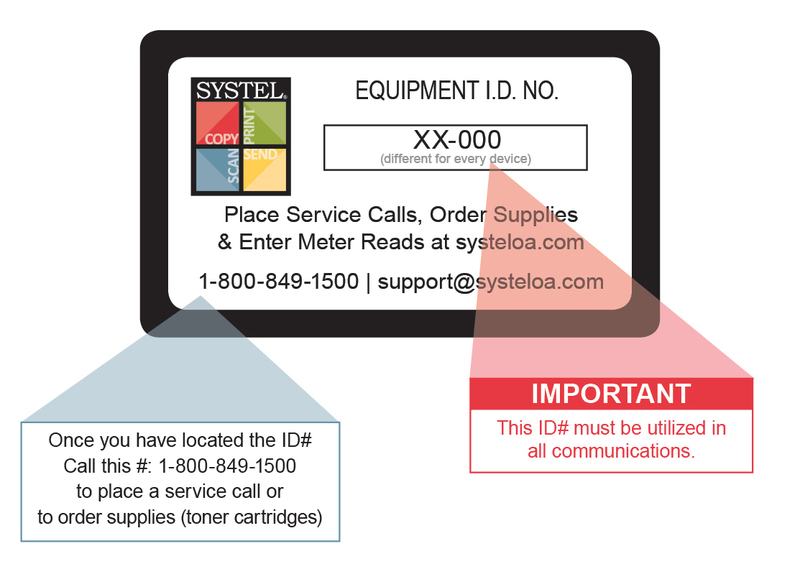 The Federal ID# can be found on all Systel Invoices at the top left side under the Systel Business Equipment address. Do you offer products other than copiers and printers? Yes, we pride ourselves as being a one vendor solution. Services and solutions include: managing multifunction devices, printers, software applications, IT and networking, production printing devices for in-house print shops and specialty products such as wide format or 3D printer needs. How long has Systel been in business? Systel was opened in 1981 as family-owned business corporately headquartered in Fayetteville and still is today. 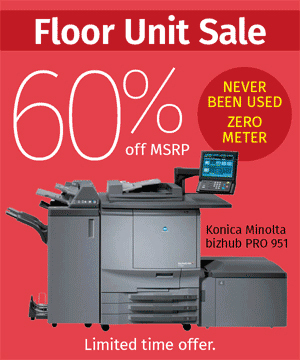 We are one of the largest independent office equipment providers in the Southeast. Systel proudly partners with Ricoh, Konica Minolta, Panasonic, HP, and Lexmark to provide a wide range of business equipment, document management software and solutions, as well as award- winning customer service. Systel is a North Carolina based company with annual sales of fifty million dollars and over 250 employees. Systel is the Southeast's Largest Independent Dealer of Ricoh, Panasonic, HP, Lexmark and Konica Minolta Products & Solutions serving nine locations throughout the Carolinas and Georgia. How do I place a service call and/or order toner cartridges?